Kwentong Bayan: Labour of Love is a community based comic book project, created by the Kwentong Bayan Collective in close collaboration with caregivers, advocates and community allies, about the real life stories of Filipin@ and Filipinx migrant caregivers* who work under Canada's Caregiver Program (formerly known as the Live-in Caregiver Program). The comic book is meant to be an accessible resource to highlight the realities caregivers experience. These are stories of community and friendship, love and struggle, and women's empowerment. These are the stories that rarely make mainstream media or academic research. Why is the comic book named, Kwentong Bayan: Labour of Love? In the Filipino language, "kwentong bayan" is the literal translation of "community stories". Labour of love reflects our understanding that both community-based artwork and caregiving work is rooted in love, is valuable, and deserves respect. When can we read the comic? Our full-length comic, Kwentong Bayan: Labour of Love is currently under production. We have published excerpts in The Peak, Our Times, Briarpatch, and Ricepaper Magazine 19.4 on Asian and Asian Canadian activism. We are featured in the Imaginings Project: Comics and the Anthropological Imagination curated by the Centre for Imaginative Ethnography. 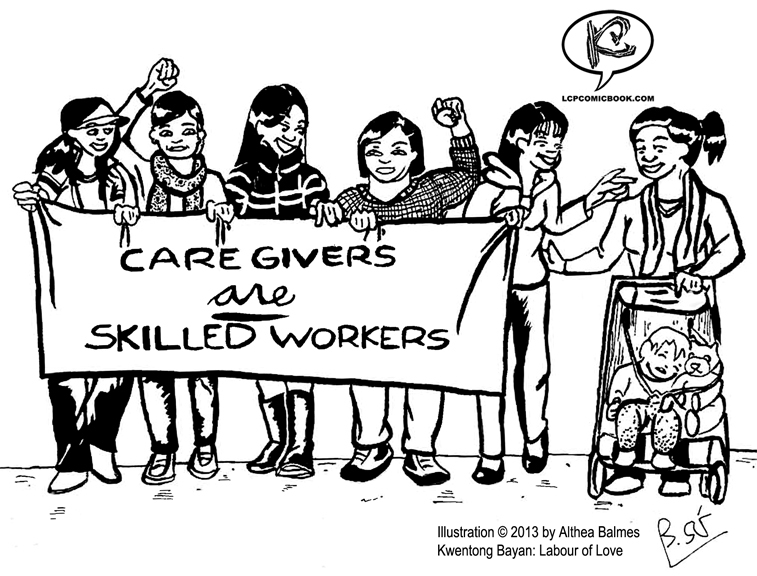 Kwentong Bayan Collective contributed a 10-page mini-comic about the history of the Live-in Caregiver Program to the Graphic History Project. It was published online by the Graphic History Collective from 2014-2015. Kwentong Bayan's 10-page mini-comic on the history of the Live-in Caregiver Program is featured in the anthology, Drawn to Change: Graphic Histories of Working Class Struggle, edited by the Graphic History Collective with historian, Paul Buhle. The book was launched in 2016 and is available from Between the Lines Press. Drawn to Change was awarded the 2017 Canadian Historical Association Public History Prize, and the 2017 Wilson Book Prize for making Canadian history accessible to transnational audiences.